Normals and Flat Shaded Meshes. Each triangular facet of a mesh comprises three vertices. For an individual facet BabylonJS computes its normals as mathematical normals, at right angle to the facet. However there is no necessity for them to be set at right angles and for curved shapes such as a sphere they are not. In the case of a sphere they are set as the mathematical normal of the sphere surface rather than that of the flat facets of the mesh that create the sphere. Vertex normals are used by the shader code in calculating how the mesh is lit. In the following two playgrounds see how the changing directions within the normals array affect how it is lit. 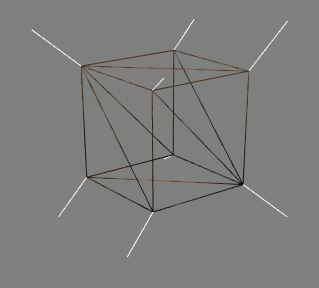 The box above has 8 vertices. If we want to keep the indices to the minimum they will be 0, 1, 2, 3, 4, 5, 6, 7. 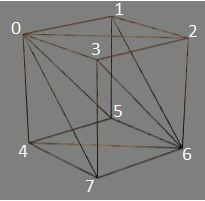 Facets 0, 3, 7 and 3, 7, 6 and 0, 3, 2 all have vertex 3 in common and vertex 3 can only have one entry in the normals array associated with it. 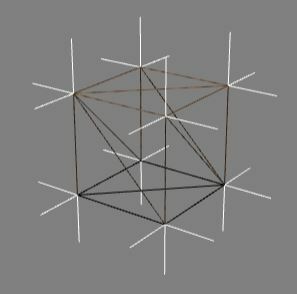 How does BabylonJS calculate the 'normal' for vertex 3? The diagram below shows that the average of the three mathematical normals at each vertex is used. NOTE: each of the triples in the normals array is referred to as a normal even though they are not strictly speaking the mathematical normal of the facet they belong to. They could however be the mathematical normal of the intended surface of the shape at that position. Besides minimising the number of vertices needed there are other advantages as will be seen when creating a sphere. 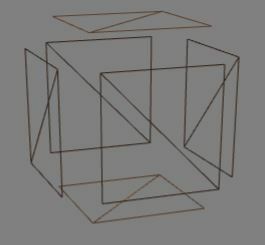 There are times, such as needing each face of a box to be covered in a different material, when it is better to have the box constructed from seperate faces each of which are contructed by two facets and no two faces sharing a vertex indices. They will of course share vertex positions. In BabylonJS this can be achieved using the convertToFlatShadedMesh function. The results are shown below. Sharing normals means that the shader produces a rounder looking sphere since the vertex normals are the mathematical normals of the sphere surface. Applying the function converToFlatShadedMesh shows the individual faces making up the sphere. For a flat shaded sphere the normals of each facet are the mathematical normals of the facet.